SUMMER "BLUES" - 4 PATTERNS STARTING FROM THE LEFT. (1) AMISH 1",1", 2" -- LINEN WOOL WEFT, BLUE/TAN WARP. 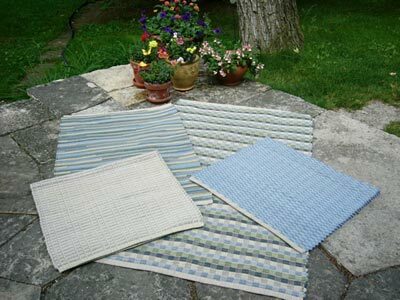 (2) HIT-MISS -- PERIWINKLE, DENIM, SEA GREEN, LINEN WOOL WEFT, SAGE/TAN WARP. (3) COBBLESTONE 1" -- PERIWINKLE, LINEN, DENIM, SEA GREEN WOOL WEFT, SAGE/TAN WARP. (4) AMISH WEAVE 1" -- PERIWINKLE BLUE WOOL WEFT, SAGE/TAN WARP.